When you talk about Paige Alms’ big wave accolades, you get used to seeing superlatives next to her name. But the Maui local and perennial Jaws standout is more than the two-time defending women’s Big Wave Tour champ. As a founding member of the Committee for Equity in Women’s Surfing and the athlete representative on the BWT, Alms was instrumental in ushering in the era of “pay equality” across the World Surf League’s various tours. The coverage of the third annual Women’s Jaws Challenge back in November was intensely-focused on the gigantic waves and wild conditions. And rightly so. But lost in the mayhem was the fact that it was the first contest since the WSL’s equal pay announcement to offer the same money to men and women for placing first, second, third, and so on. Given the monumental nature of the past year for women in big surf, we found it especially apt to catch up with Paige about Jaws, equal pay, and the Big Wave Tour. 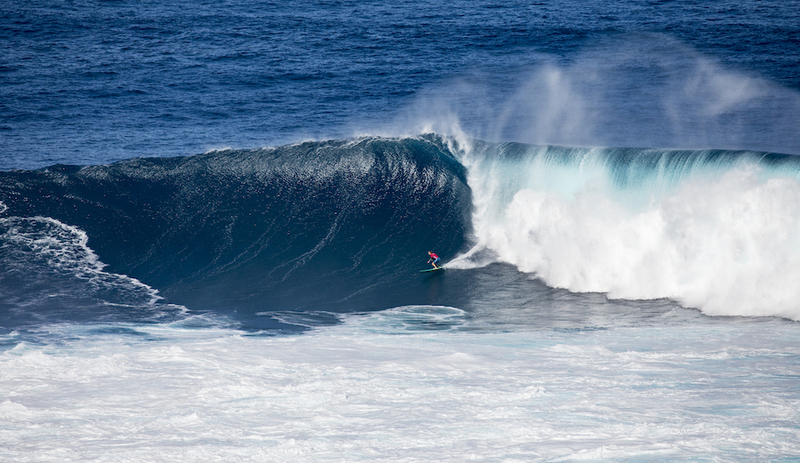 So, the Women’s Jaws Challenge was nuts this year. Conditions looked pretty unruly. Can you walk me through what it was like out there? It was kind of weird. I mean, we showed up first thing in the morning because we thought the morning was going to have the best conditions. But it was black everywhere and you couldn’t see the horizon. It’s pretty rare for Maui. It was almost like fog, but just rain clouds. You couldn’t see where you were in the lineup. That happens at Mav’s a lot, but it doesn’t happen much on Maui. Looking back at our trees and landmarks, I couldn’t see where we were. So, the morning started off wonky and weird. And, honestly, if I had shown up there on a free surf I would’ve sat on the ski and watched. It wasn’t very good. Every set that came in had a big warble through the lip. You could see that the swell was still jumbled up from the day before. And they wanted to start it as early as possible, so basically we were just out there first thing. It was pretty wonky and treacherous and weird. That was just the beginning of the swell. It was a little sketchy. You go from it being 15-to-18 [feet] to solid 25-foot within one set. It wasn’t ideal conditions. It was a challenge. I think few people realize that this was the first event where the women received the same pay as their male counterparts–since it won’t go through for the women’s CT until March. Was it validating given you and many of the other women competing helped bring that initiative across the finish line as members of the Committee for Equity in Women’s Surfing? Oh, for sure. I wish that the WSL had taken advantage of that. Running the event on the first swell of the year, they weren’t able to capitalize on showcasing that because I think that event will be remembered as the first [with pay equality] ever. There have been other single events, but as far as launching equal pay for 2019, every event from now on will be. And that was the first of its kind. Definitely having a part in [equal pay], it was very special to share that with Andrea [Moller] and Keala [Kennelly] and Bianca [Valenti]. It was kind of a wild ride the past couple of years dealing with stuff for Maverick’s. Speaking up for what we want can be kind of scary sometimes. Luckily we all had each other’s backs, and to be able to share that accomplishment as a team and a committee and as a whole for all of women’s surfing. It’s a huge win for everyone. And it’s cool to see surfing set a benchmark and a precedent for other sports. I’m really proud to be a part of that. Definitely having a part in [equal pay], it was very special to share that with Andrea [Moller] and Keala [Kennelly] and Bianca [Valenti]. It was kind of a wild ride the past couple of years. You’ve been pretty open in the past about your thoughts and emotions when you’re about to paddle out at Jaws and the waves are huge. How do you think admitting fear to yourself helps you manage it or even channel it? So, yeah pushing through fear is one of the most empowering feelings for me. Being able to recognize that and be true to yourself and know that you can challenge yourself to overcome that feeling and you put your heart to it and do it, it’s such an amazing thing. You feel like you can do anything. Being able to push fear aside is when something special happens. And that’s when I’ve ridden some of the best waves of my life. With everything that went down around Mav’s last year with equal pay, how symbolic is it to (hopefully) finish the Women’s BWT there? I really, really, really hope we get to run this event and especially in good conditions. It’ll just solidify everything that we’ve been working for and also give us the opportunity to celebrate and surf out there for the first time, just the women. I think it’s going to be a really monumental surf contest, and to finalize the year for the men and women at the same event will be really exciting. That wave is just amazing. I would love to paddle into the biggest wave a woman has ever paddled into. Most people know you as the two-time big wave world champ and especially for being a standout when Jaws is firing, but you were involved in a different kind of project last year called Collaging the Line. Tell me a little about that. It was at a time in my life and my summer that I had so much going on and I was so stressed out and it was such a refreshing trip to go on. I would love to win Mav’s. That’s on the top for the next couple weeks. And I would love to paddle into the biggest wave a woman has ever paddled into. Hopefully, this winter before the season is over.